Ottavia of the Talemantine Empire ("The Renaissance Queen") (1455 - 1513) was the wife of King Harald III of Arendaal and thus the Queen Consort of Arendaal between 1480 and 1497. Her marriage was arranged by her aunt, Eliana of the Talemantine Empire, Queen of Arendaal. Eliana had been the Aren Queen consort until 1454 (her husband King Pieter I had suffered from a mental illness and had abdicated in favour of his brother, the father of Harald III, King Gustav IV), but remained a key figure at court. She arranged Ottavia's marriage to Harald III of Arendaal and simultaneously arranged the match between Ottavia's brother, Giovanni Luciano IV of the Talemantine Empire to Harald's sister Nikolina of Arendaal. Ottavia and King Harald III were married in 1477. Their wedding remained in annals for its magnificence and the sumptousness of the festivals and banquets involved. Harald III, was Arendaal's famous "Renaissance Prince" and Ottavia presided over his court as an exemplary Renaissance Queen. He was a famous patron of artists, a brilliant ruler, good-looking, charismatic and personable. Ottavia's interests, beauty and grace made her an ideal consort for such a magnificent ruler. In addition to the scholars, artists, philosophers, inventors and musicians she entertained, she also wrote sonnets. She read these to famous poets, comparing them with their compositions. The poems remain of a biblical theme (the sacred stories), as well sacred hymns to folk music, and interestingly, numerous tales in the Classical style, dealing with love and earthly experience. Her shared tastes with her husband gave them an instant rapport and the marriage is considered a successful one. Ottavia was considered an ideal Renaissance beauty. The most famous portrait painted of her (seen above) is considered a jewel of European Renaissance art. The curator of the Hermitage Gallery in the 19th century said of it that there was: "No Picture More Beautiful on Earth." 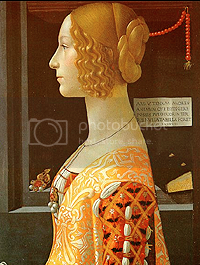 A close examination of Ottavia's dress and accessories -- jewels, book, coral chain, and written sheet -- reveals an elite, quattrocento interior, largely void of iconographic connotations. 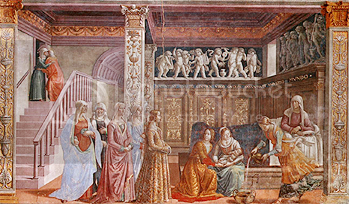 The presentation of Ottavia's beauty corresponds with various descriptions in contemporary sources and focuses primarily on her physical appearance and less on her inner virtues, as in many Renaissance works. Ottavia's daughter, Marguerite I bore a remarkable resemblance to her. Ottavia doted far more on her son Rurik II than did her husband, altough she never openly opposed Harald III's decision to name Marguerite his heir over Rurik. 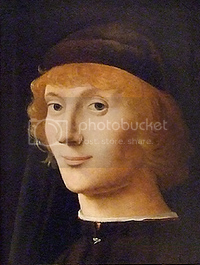 Ottavia died in 1513 and thus never lived to see Rurik's attempt to usurp the throne of Marguerite's son, Frederik II.